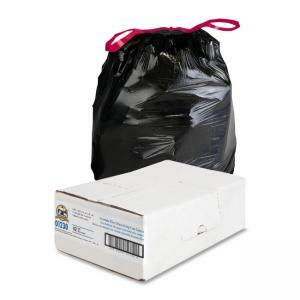 Flexible drawstring trash can liners are extremely flexible and expand around all sorts of objects and trash. State-of-the-art linear, 1.05 mil low-density resin offers superior puncture-resistance. Patterned design makes it easy to differentiate from regular drawstring liners. Convenient drawstring closure keeps hands clean and free of trash. Each can liner holds 30 gallons.